There’s something so wonderful about salads. It’s probably the fact that they can be made in infinite varieties—there’s no right or wrong way to make one, and in terms of color, texture, and flavor, salads really deliver. And when topped with our meats and cheeses, a simple salad becomes a meal. Our Turkey and Strawberry Salad is just perfect for this time of year, when berries are more apt to be in season. 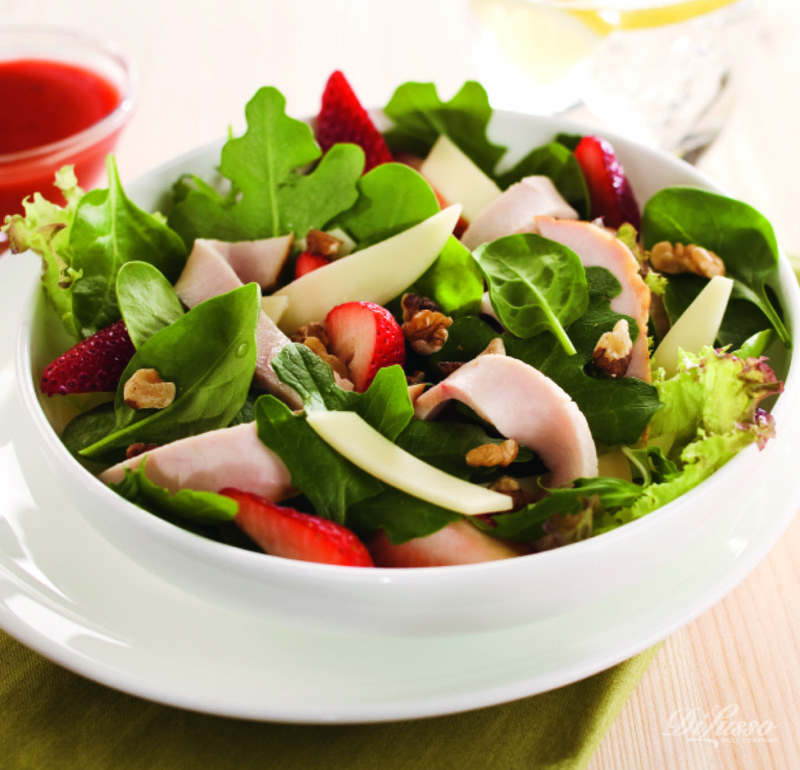 A combination of mixed spring greens (or fresh spinach—that superlative superfood) with our Honey Turkey Breast and Provolone Cheese, chopped walnuts, and sliced strawberries is a beautiful sight, and the strawberry vinaigrette is the perfect combination of sweet and tart. This salad would do well for lunch, dinner, or a side salad with an entrée—it’s delish any time of day. Southwest Mesquite Chicken Salad brings traditional southwestern flavors to the salad bowl—bold and flavor packed. 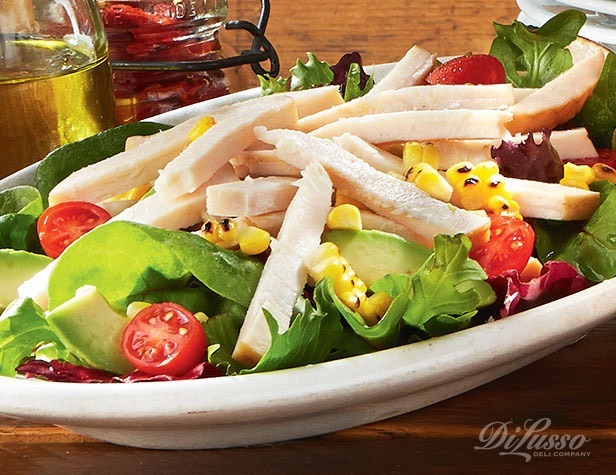 Our Mesquite Style Chicken greets mixed greens, roasted corn, tomatoes, and avocado, adorned with a zesty chipotle-ranch dressing. Make it on a warm night for a light dinner along with some fresh fruit and crispy tortilla chips. With salads, you really can take it with you. All you need is a good-sized jar with a lid. 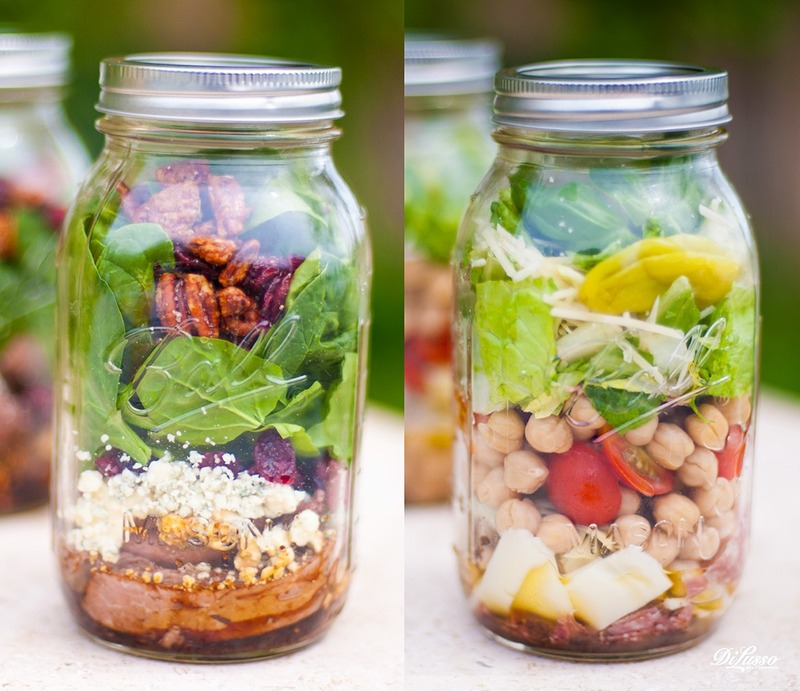 Salad in a Jar is not only convenient—it’s fun. Take one to work, and you’re bound to impress and inspire.It’s all about the assembly. You’ll want to start with dressing on the bottom, followed by meats and cheeses, then vegetables, and then your salad greens. Leave enough space at the top so you can shake it up to mix the ingredients thoroughly.Try this Balsamic Beef Salad in a Jar: start with balsamic dressing on the bottom. Layer our Roast Beef strips, gorgonzola cheese crumbles, dried cranberries, candied pecans and top it off with fresh spinach. You’ll love the way the roast beef “marinates” in the dressing, making it even more succulent than it is when you buy it. And the combination of tangy gorgonzola cheese with the tartness of the cranberries and the crunchy sweetness of the nuts makes this salad a real winner.Another delicious salad to make in a jar (it would work in a regular bowl as well) is this protein-packed Sorrento Salad in a Jar: start with Italian dressing, and then add our Dry Salami, in strips or chopped, our Mozzarella, grape tomatoes, garbanzo beans, and mixed greens. Just shake it all up and enjoy. Adding meats and cheeses in any combination—to any of your favorite salads—only makes them better. Experiment. Create. Have fun! And feel good knowing you’re getting your dark leafy greens and plenty of protein.